NEW YORK (CNNMoney.com) -- After 12 years on the job, Derek Christian tired of selling cleaning supplies at Procter & Gamble and yearned to become an entrepreneur. So in 2007, he acquired My Maid Service, a cleaning company in Lebanon, Ohio, that catered to the needs of an affluent clientele in Cincinnati. The company already had healthy sales of $260,000 a year. But Christian quickly zoomed in on the major obstacle holding back higher revenue: staff turnover. No one grows up wanting to clean houses for a living. My Maid Service's employees lasted an average of just four months each. That led to customer dissatisfaction, since clients didn't want a changing cast of cleaners entrusted with their house keys. The turnover rate that first year was 300%, forcing Christian to spend most of his time hiring and training staff. Pay hikes alone didn't seem to be enough to keep staffers with the company. So Christian brought in a consultant, who helped him come up with an unusual solution: My Maid Service would pay to train its employees for new jobs. "The agreement is employees must work for two years," Christian says. In return, he meets one-on-one with each employee and works with them on a customized career plan. Some workers are aiming to become office managers or cleaning service supervisors, while others are drawn to industrial jobs like being a medical assistant. Christian pays for training classes online and at local community colleges. The cost is modest, with most local classes changing $75 to $100. Some workers also pick up training assignments at the cleaning service, such as designing an advertising campaign to develop their marketing skills. Dan Bobinski, a Boise-based management consultant and author of Creating Passion-Driven Teams, says Christian's training strategy is both uncommon and strategic. "He's looking at their motivation and saying 'If you stay with me doing these menial jobs, I'll pay for what you really want to do.'" That can deliver bottom-line benefits. Hiring and training entry-level employees costs an average of $2,000, so spending money on programs that keep existing staffers around longer is a smart investment, Bobinski says. And training is one of the best benefits a company, even a small one, can offer. The number-one reason people leave their jobs is that they don't feel challenged, he says: "People, especially of this generation, want to learn new things." Thanks to the training offer, some new pay incentives, and monthly performance reviews, My Maid Service's turnover rate for its 32-full time employees hit zero in 2009. Christian expects attrition in 2011, when his current crop of employees will complete their training classes, but he's confident his new hires will be similarly loyal. Beyond cutting training costs, a stable employee roster boosts sales. Having one employee cleaning a house for an extended period heightens consistency, builds trust with customers, and reduces the possibility of theft. "The lower employee turnover rate leads to higher customer retention," Christian says. To grow sales, Christian also adjusted his marketing strategy. Realizing that middle-class professionals like teachers and public-sector workers rarely relocate, he set out to recruit more of them as customers. Mailings went out offering free cleanings to the first three police officers, fire fighters or teachers who responded, and 50% off the first cleaning for other public employees. Emboldened by his success in Ohio, Christian decided to expand. In 2008 he launched My Maid Service in Dallas with his brother Shawn, who runs the local business and has an ownership stake. Despite a more-competitive market --"many underground businesses use illegal immigrants that charge less," Christian notes -- the Dallas office generated sales of $225,000 in 2009. With the Ohio branch doing sales of $775,000, that put My Maid Service's 2009 revenue past the $1 million milestone. Christian doesn't plan to stop there. 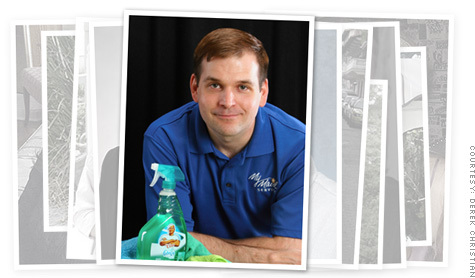 He's opening offices in this year in Northern Kentucky and Dayton, Ohio, and expanding into commercial and carpet cleaning -- an expansion driven by a the frequent customer question, "Do you clean businesses?" My Maid Service is on target for 35% sales growth in 2010. Training your staffers to quit their jobs is an ironic way to cut staff attrition, but Christian says it's paying off -- having a satisfied employee stay two years is preferable to having disgruntled one leave in just four months.